Many people come to Mont St-Michel just to see the Abbey, but if you have more time—and if the tides cooperate—plan on taking some walks. We saw sheep grazing and got beautiful views of the fog-covered Mont St-Michel. Mont St-Michel is fortified, and the ramparts give you excellent views of the Bay. You can also access a number of restaurants and cafés from the ramparts. Some walks will take you to towers—North Tower, Gabriel Tower, Tour du Roi—which offer great views and opportunities for photos. A walk all the way around Mont St-Michel should only be attempted at low tide, with no high tide expected. 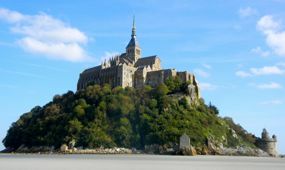 Because of the tides (which change from hour to hour, day to day and month to month), at some times Mont St-Michel is surrounded by firm sand—and not water. We could safely walk around the entire island and see it from all perspectives. A number of organizations offer guided walks farther out in the sand. Some areas can be dangerous, so these walks should only be done with a guide. Check at the Tourist Office for information. There are numerous sets of stairs and small alleyways on Mont St-Michel. Just wander and explore (being prepared to climb) and you'll get different perspectives. Given the size of the island, you can't get too lost! You'll find that you eventually will come back to the Grande Rue, the main street of the island. During the day it will be mobbed with visitors, but in the morning and evening it can be charming too. A new dam has been built at the southern end of the causeway to control the flow of water from the Couesnon River. 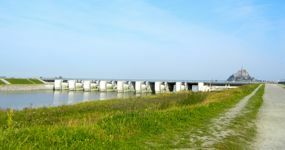 You can walk to the dam and across it, for some beautiful views of Mont St-Michel and interesting explanations of the project. You can also observe the timed release of water, part of the project to restore the maritime heritage of the area. And if you still want more walking, you can walk along the river to the small town of Pontorson, about 9 kilometers (5.5 miles) south of Mont St-Michel. north (sea) side at very low tide. 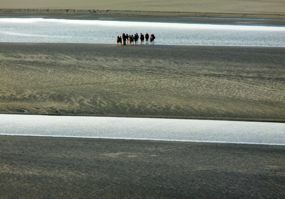 Below, a group learns about the salt marshes and Bay of Mont St-Michel. Above, Dam on the Couesnon, with Mont St-Michel in the background.